Rare, unusual and interesting antique costumes and textiles; for museums and collectors looking for that extra special piece, for new and established collectors and for those with a modest budget who want to adorn their person or home. Stunning and decorative. Look good framed. 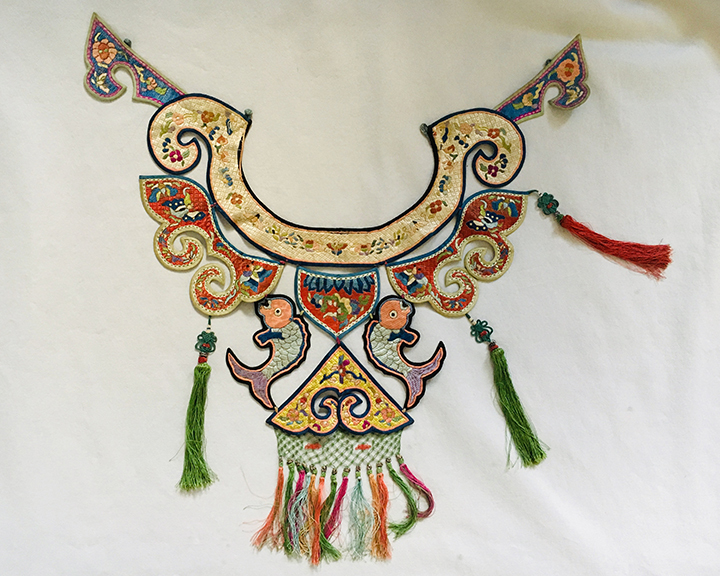 The circular neck band with hanging jui shapes, fish and a central triangular motif, all worked in counted stitch with some gold wrapped silk couching, each motif outlined with hand woven very narrow braids, rust and green silk tassels hanging from endless knots, the triangular motif with macrame and small tassles with endless knots, all in polychrome shades of rust, ivory, apricot, blue, green, yellow, pink, indigo and black. Very very good. One rust tassel missing from the left top, as you look at the piece.